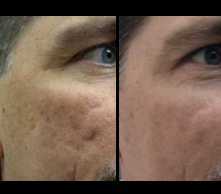 Bellafill | Artefill for acne scars is now FDA has approved. This means that Suneva Medical Inc., the maker, can market Bellafill, also known as Artefill for acne scars of the cheek. Bellafill | Artefill fo acne scars is nothing new but what the approval means is that using Artefill for treatment acne scars will no longer be “off label”. Bellafill is the new name for Artefill as Suneva Medical rebranded Artefill in December, 2014. Bellafill has been shown to last at least 5 years and the non-absorbable polymethyl merthaculate (PMMA) microspheres are not absorbable and thus Bellafill will likely last at least 5 years according to the formal FDA studies (the informal studies are now out 20 years). The bovine collagen gel in Bellafill provides immediate volume and lift at the time of treatment. Over the ensuing 3 to 6 months the collagen is absorbed by the body, but the polymethyl-methacrylate microspheres (PMMA) remain in place and act as a bio-stimulant so that you replace the collagen with your own collagen and tissue. “Bellafill | Artefill for acne scars has been the best thing I have done and I have tried just about everything” is how one patient put it.